The top four firms in Architectural Record’s yearly ranking held tight to their places from 2016, reports the Architectural Record. AECOM, Perkins+Will, and Jacobs followed San Francisco–based Gensler, which clinched the No. 1 spot for the sixth year in a row, seeing more than $1.19 billion in revenue—an increase of more than $100 million since 2015. 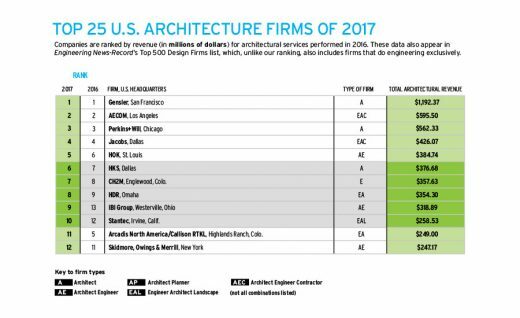 The annual Top 25 US Architecture Firms list, compiled by Engineering News-Record, ranks companies by their architectural revenue from the prior year, as reported to ENR by firms that choose to participate. Gensler co-CEOs Andy Cohen and Diane Hoskins noted the growing importance of virtual, augmented, and mixed-reality platforms, which are having a real impact on the design process. AECOM maintained second place, with firm’s architectural revenue has decreased slightly in recent years, from a five-year high of $801 million in 2014 to $605 million in 2015, and just under $596 million in 2016.
image courtesy of Architectural Record. Perkins+ Will in third place saw an increase in revenue of almost $80 million. Corgan experienced the largest jump of the Top 25 firms on this year’s list, moving from 22nd place in 2016 to 14th.